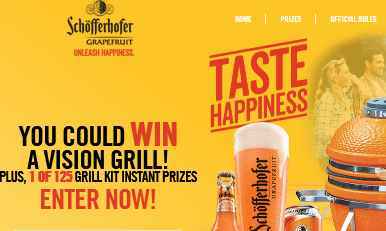 Schofferhofer Grapefruit brings you the Schofferhofer Grapefruit Taste Happiness Sweepstakes where they will be giving away a Vision Grill plus 1 of 125 Grill kit instant prizes. During the sweepstakes period visit this link: www.schoff.us/happy to go to the sweepstakes page. There is a limit of one (1) entry, per valid email address, per eligible person, per day per street address per Entry Period. When To Enter: The Schofferhofer Grapefruit Taste Happiness Sweepstakes begins at 12:01 AM Eastern Time (“ET”) on 06/01/18 and ends at 11:59:59 PM ET on 08/31/18. Sponsor: Radeberger Gruppe USA, Norwalk, CT.Vision Grills LLC and its parent, subsidiary, and affiliated companies. Sweepstakes Prize: The Grand Prize Winner will receive the following (the “Grand Prize”): Each Grand Prize Winner will receive one (1) Schofferhofer Grapefruit-branded Vision Grills Classic Cadet Series Kamado grill.The Approximate Retail Value (“ARV”) of each Grand Prize is $350.00.The ARV of all Grand Prizes to be awarded is $10,500.00. Instant Win Prize:One (1) grill accessory kit which includes one (1) set of grilling utensils, one (1) Schofferhofer Grapefruit-branded apron, and one (1) Schofferhofer Grapefruit-branded grill mitt.The ARV of each Instant Win Prize is $47.00.The ARV of all Instant Win Prizes is $5,875.00.